Two people are dead after an early morning wrong-way driver hit another car head on in Fort Worth at I-30. Around 3:30 a.m. Fort Worth police say one of their K9 officers saw a car going westbound in the eastbound lane at Lancaster. Simultaneously, multiple calls came in from people on the road reporting the same incident. Buddy Calzada with FWPD said police were able to deploy spike strips to slow down the vehicle but minutes later the car collided head on with another. The two drivers were pronounced dead at the scene. Investigators are on scene right now and authorities say those trying to travel eastbound towards Dallas will need to find an alternate route for the morning commute. Over in DeSoto at I-35 and E. Belt Line there was an accident involving a flipped semi-truck. Authorities in the area are on scene and investigating. DeSoto police say an 18-wheeler overturned causing the trailer to break open. As a result there is a large debris field and a fuel spill that will need to cleaned. Parts of both highways will be affected for the morning commute, seek an alternate route before heading out the door. Just before midnight on I-20 westbound at Grand Southwest Parkway, a private tow truck driver was helping a stranded driver when they were hit by another car. The driver of that car left the scene and took off towards Arlington. Police are still looking for the fleeing car and the driver. The tow truck driver, identified as 46-year-old, Keith Jermaine Holt died at the scene. 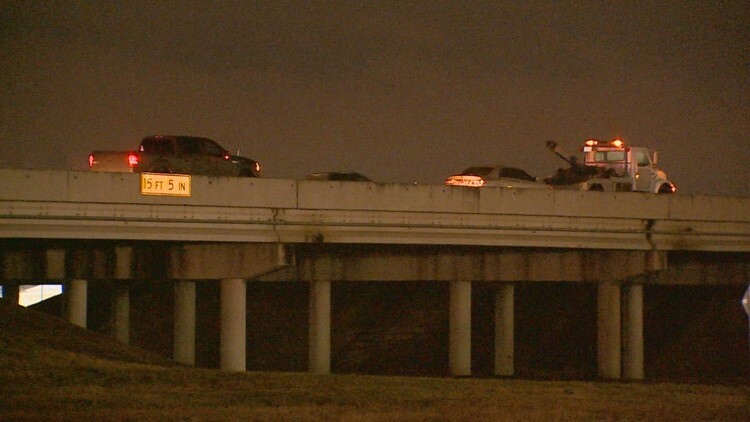 Parts of I-20 were closed in the early morning hours Friday but have since reopened. Anyone with information about the crash is asked to call Grand Prairie Police at (972) 237-8906, or Crime Stoppers at 972 988-8477 (TIPS). Tips may also be submitted online at www.GPCrimeStoppers.org. This is the first traffic fatality in Grand Prairie this year.